BACOLOD CITY—Since Tuesday, I’ve been here with hundreds of other athletes, coaches and parents for the national finals of Batang Pinoy, a priority event of the Phil. Sports Commission for the nation’s best athletes aged 15 years old and younger. Bacolod was not the original choice of venue. Zamboanga City was awarded that distinction but, due to the bombings that rocked the Mindanao city last year, PSC moved the venue to the City of Smiles. Yes, the Bacolodnons are known for their smiles. Just listen to the Ilonggo’s sweet dialect and you’ll know that people here are friendly. Bacolod is a city I called home for the first 14 years of my life. I played varsity basketball in La Salle. Bob’s, Chicken House and Pendy’s were – and still are – my favorite restaurants. While here, we got to tour several of the sporting venues. The Batang Pinoy headquarters is located in a giant piece of land called the Panaad Stadium. If the name sounds familiar, that’s because this is the preferred venue of the Azkals, especially given it’s 35,000 seating capacity. Numerous games by our Philippine football team have been played in Panaad. It’s located a bit far from the city proper but it’s expansive and huge and littered with tall Gemilina trees that make it look like a forest. Swimming pools. Tennis courts. An international-standard track oval. These and many more venues are housed in Panaad. Our only complaint is not the distance but the lack of signages. We hardly found a single large sign with the word PANAAD. Or, at least, given that this is a large event, signs of BATANG PINOY to lead the visitors. Still, this venue is essential. Compared to our city, we admit that the Cebu City Sports Complex is conveniently-located but it’s too small – especially for a metropolis as large as Cebu. Cebu needs a Panaad. We also got to visit other venues. Badminton was held at the Pohang Badminton Center, right behind the Riverside Hospital. There, we got to see dozens of youngsters playing in the four indoor courts. We visited La Salle. At the covered court, volleyball spikers slammed the ball while hundreds of La Sallians watched. With tennis, the results are in and it was a near-sweep for Team Cebu City: we won three out of the four gold medals at stake. Zethley Mae “Anday” Alferez was the event’s star when she won the singles and doubles events at the Montevista Tennis Court. My daughter Jana lost to a Laguna-based player in the semifinals and settled for bronze in singles but partnered with Alferez to win the doubles gold. Among the boys, Noynoy Seno of USC captured the boys title via a clinical 6-2, 6-2 win in the finals. 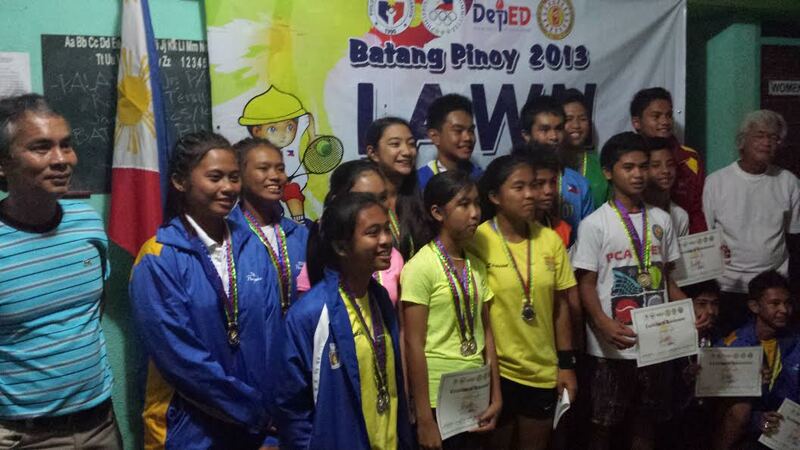 Shyne Villareal, Jermaine Laurel and Norman Enriquez also won bronze medals. While staying at a hotel here, I woke up early last Thursday to do a morning run at the back of the City Hall. While descending the stairs at 6 a.m., guess who I saw? Maxi Maximo. They also stayed in East View Hotel and arose early (with wife Sheila) for breakfast because their daughter Ica was joining the cycling contest. The day after, I read that Ica won gold. She added a silver in the MTB race. We also met CCSC Chairman Edward Hayco at the boxing event. Of our three Cebu City boxers who vied for gold, we witnessed one who won the top prize. One non-sports event that we enjoyed here was the Bacolaodiat. It’s an annual Chinese New Year celebration, running for four days, where the main Bacolod thoroughfare called Lacson Street is closed. Walking along Bacolod’s version of our Osmeña Boulevard, you’re treated to a joyous party and celebration. Chicken inasal is grilled at every corner. Loud music booms. Red lanterns hang at the center. Though not as large as the Masskara Festival, it’s gotten bigger each year. Cebu ought to emulate Bacolod in this street party concept. It’s excellent for tourism. The Bacolaodiat and Bacolod’s chicken inasal: the perfect doubles tandem to accompany the Batang Pinoy.